Find hotel near Sardar Vallabhbhai Patel .. 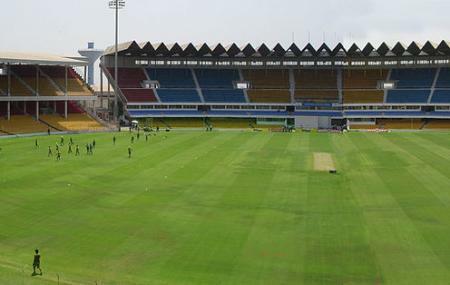 The stadium is known for being one of the most popular cricket grounds in India and also called as ‘Motera Stadium’ by people. It was brought to life in 1982 by Gujarat government who wanted to spawn a better place to host international games that were till then being played in Municipal Corporation’s stadium. The place is spread over an area of 50 acres and has witnessed many international and national games since its inception. It does not have many things to see per say, yet you can come here if you are into sports and walk around reminiscing about the stories of the past. If you are lucky, you can even get to meet the locals and interact with them about the events held here. Permission might be needed to enter the premises. Contact the authorities before visits. The ticket price depends on the event happening here. Check the website before visits. How popular is Sardar Vallabhbhai Patel Stadium? People normally club together Gujarat Vidyapith and Ahmed Shah's Mosque while planning their visit to Sardar Vallabhbhai Patel Stadium.